Our Clear Moisturiser SPF 30 got a new look! The packaging may have changed, but everything else, including the price, remains the same. Our lightest moisturiser for oily, breakout-prone skin. This water-light moisturising fluid minimises the appearance of pores and protects skin from the sun’s rays to help prevent the early signs of ageing. The non-greasy formula keeps excess shine in check while soothing, plant-based antioxidants work to fade red marks and calm skin. I use it 365/365. I found at last an spf product that is OK for my mixt skin prone to breakout and brown marks (age...), for an every day use, and I hope PC will never stop it !!! This moisturizer is very light weight and I think it works well on my sensitive combination skin. In the evening I use a richer cream because this is not enough for the drier areas of my face. However, in the morning this is perfect. This moisturizer feels light and absorbs quickly. However, after a while, it looks VERY shiny and greasy. I'm sure it is fulled with good ingredients but I can't imagine that this good work for an oily skin. I have rosacea but this didn't sting at all. That' the good thing to say about this. If you are still looking a day moisturizer with SPF for an oily skin I can highly recommend Resist SPF30 (tinted moisturizer). I can't seem to find a better one but luckily I don't need to! Customer Care: Hello Rose, thank you for sharing your experience with us. We're sorry to hear this didn't work as expected for you! Please contact a member of our Customer Care team, who can assist you with a possible alternative. Unfortunately, this product didn't work for me. My skin is more of a normal type, with some tendency to oiliness towards the end of the day. However, with this product skin become very shiny after an hour or so. It just does not soak in leaving an unwanted layer on my skin. That really is a shame since it is very hard for me to find a good sf product that my skin would tolerate, and I had high hopes for this one. I'm using PC 2% BHA exfoliator and it's great, but I can't use it without spf, but I also cannot continue using this spf product. Btw, at the evenings I use Resist barrier repair moisturiser and although it is for normal to dry skin, it's very comfortable to wear. This SPF works good on my combination skin. The light, watery texture makes even dry patches on my cheeks moisturized, which other SPF products have never did for me. It doesnt feel dry at all after applying and gives my skin a nice glow. I like how my skin looks with this SPF. Although it smells a bit special, i dont mind as long as it does the job! Good work Paula! Please keep it like this and dont change it! Now its out of stock for Europe but im looking forward to buying it soon!! P.S the customer service at PC is really nice, many thumbs up too!! Customer Care: Thank you for your review and for the compliment. We are happy to hear that you like this product. Hopefully it will be back in stock soon, however you're welcome to contact our team for more information on an alternative. I have acne problems and I needed a spf because of my treatment against it. My forehead it's been clean for several months but every time I apply this moisturizer I become very skinny and small pimples come out (they are like watery/oily pimples).. My problem zone now are the cheeks and chin...My pores become very clogged and i get lots of little whiteheads under the skin... Also, for me the smell is a problem because my nose is very sensible to every kind of fragrances...I'm glad I bought the trial size because I'm disappointed.. It only makes my skin matt for 20-30 minutes max..After that I become very skinny and when I touch my face I have a very greasy layer with white product...I think this is a good product for a day on the beach.. I didn't tried this under makeup but I don't think it would do a great job.. I would repurchase again, but I am definitely open to try the other moisturisers for something better. I am looking out to see if it produces more blackheads, but so far I couldn't tell since my skin has problems right now. Sometimes it stings, but the feeling doesn't last long. This is definitely not a mattifying moisturizer! Customer Care: We are very sorry to hear this moisturizer does not seem suitable, please contact Customer Care if you need further assistance! I use this in the winter time because my skin is a little drier than the summer. this is a little hydrating than resist super-light spf30 which I also like. is also suitable for the eye area, did not cause the irritation. Mattifying Fluid?!. Come on, same formula as the "Resist Youth-Extending Daily Mattifying Fluid SPF 50" and same CRAZY SHINING efect. Horrible. Customer Care: We are sorry to hear that this product wasn't a fit for you. Please feel free to contact our Customer Care Team to discuss other options. Maiken - Super shiny skin!!! I am so sad, that this moisturizer makes my skin as shiny as a disco ball!! The moisturizer burnes and stings on my skin, but the texture of the moisturizer is nice and light. I really hoped that i finally found a daytime moisturizer with Spf without color, but unfortunately it was a big disappointment, and I have to keep using the Hydralight. Customer Care: Thank you for your review. We're sorry this product didn't work for you, and encourage you to contact us to discuss our other moisturizer with SPF options along with your skin type and concerns. We're happy to help you find your perfect daytime moisturizer. It is good as it claims. Very watery but without alcohol, that reminds me some great Japanese sunscreen. It does not cause any breakout for me and keeps mattifying around 4 hours. Good enough, I will purchase it again. Aqua, Ethylhexyl Methoxycinnamate (7,5%, Octinoxate, sunscreen), Glycerin (skin replenishing), Ethylhexyl Salicylate (5%, Octisalate, sunscreen), Silica (absorbent), Octocrylene (2%, sunscreen), Butyl Methoxydibenzoylmethane (2%, Avobenzone, sunscreen), Dimethicone (hydration), Tocopherol (vitamin E/antioxidant), Chamomilla Recutita (Matricaria) Flower Extract (skin-soothing/calms redness), Vitis Vinifera (Grape) Seed Extract (antioxidant), Camellia Sinensis (Green Tea) Leaf Extract (antioxidant), Camellia Oleifera (Green Tea) Leaf Extract (antioxidant), Peucedanum Graveolens (Dill) Extract (antioxidant), Sambucus Nigra (Black Elderberry) Fruit Extract (antioxidant), Avena Sativa (Oat) Bran Extract (skin-soothing), Punica Granatum (Pomegranate) Extract (antioxidant), Lycium Barbarum (Goij) Fruit Extract (antioxidant), Hydrogenated Lecithin (skin-restoring), Titanium Dioxide (texture-enhancing), Dimethicone/Vinyl Dimethicone Crosspolymer (hydration), Diethylhexyl Syringylidenemalonate (hydration), Hydroxyethyl Acrylate/Sodium Acryloyldimethyl Taurate Copolymer (texture-enhancing), Xanthan Gum (texture-enhancing), Sodium Carbomer (texture-enhancing), Benzyl Alcohol (preservative), Sodium Benzoate (stabilizer), Potassium Sorbate (stabilizer), Phenoxyethanol (preservative). Will Clear Ultra-Light Daily Mattifying Fluid SPF 30+ fade red marks from breakouts? Because of the excellent sun protection it provides, it will help fade those lingering marks from past breakouts, especially when used as part of a comprehensive, gentle skincare routine that includes a good exfoliant and serum loaded with anti-ageing ingredients, such as Resist Ultra-Light Super Antioxidant Concentrate Serum. I have extra-sensitive skin that breaks out. Can I use this Clear daytime moisturiser? If you have extra-sensitive skin, we recommend that you try Calm Redness Relief Moisturizer SPF 30 for normal to oily skin, as it is formulated with gentle mineral-based sunscreens that are non-irritating for extra-sensitive skin. 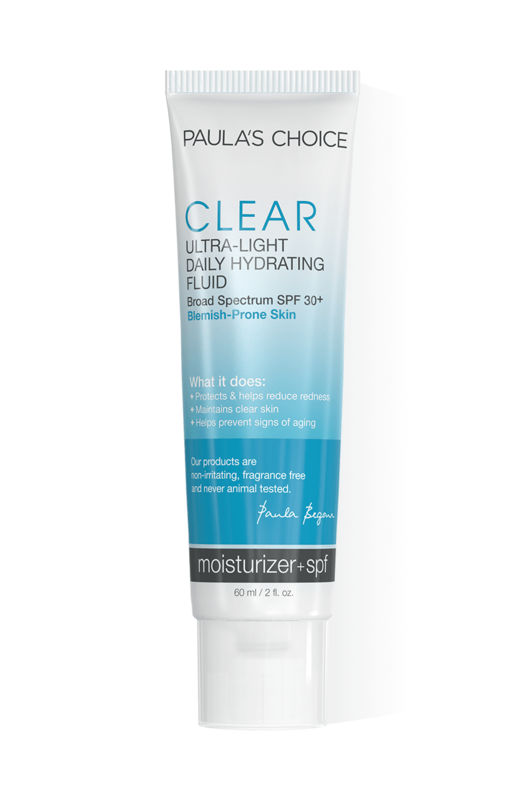 Is there another Paula's Choice product which is similar to the Clear Ultra-Light Daily Mattifying Fluid SPF 30+? Our Clear Ultra-Light Daily Mattifying Fluid SPF 30+ is identical in terms of ingredients to our Resist Youth-Extending Daily Mattifying Fluid SPF 50, apart from the sun protection. A dry skin with spots: what can you do?